The Vice Principal Ms Shailesh Bhandari had an illustrious career as a Mathematics teacher spanning over 27 years. An alumnus of St Thomas' School and Hansraj College in Delhi, Ms Bhandari holds a graduation degree in Science and Education and is a post graduate in English. A truly conscientious and immensely popular teacher, she started her teaching career with Holy Child School and moved to Delhi Public School, R K Puram She holds firm to the belief that students must experience their classrooms as invigorating and inspiring environments. Education must be a rich balance of classroom and out of class activities. An ardent advocate of 'learner centred' education, she stands committed to the best practices and strategies that address continuous improvement, individual needs and provide guidance to students to become self-directed, life-long learners while ensuring that every child's potential is achieved. 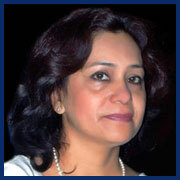 Ms. Bhandari has both attended and conducted many workshops and training sessions in these areas. During her student days, she was an avid orator and won many prizes in debates and dramatics. She pursues many interests including literature and dance.